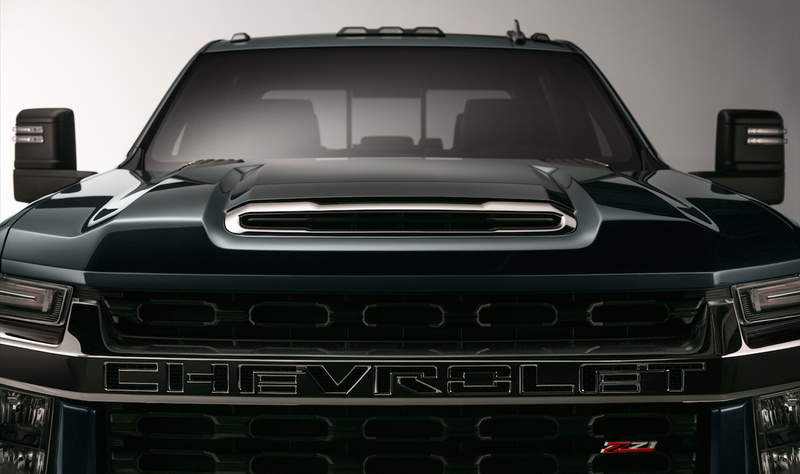 Chevrolet just released a teaser showing its new Chevrolet Silverado HD, which is set to launch in 2019 as a 2020 model. Like all heavy-duty trucks these days, it looks mean. Like, really mean. CHEVROLET it says in big letters across the grille, stretching over giant, oval-shaped grille texture and sitting below and in front of a big hood bulge and a tough-looking hood vent. Oh yes, the new heavy duty Silverado HD is coming for you in your nightmares. I might be wrong. This is just a teaser, after all. Maybe the truck isn’t actually angry; perhaps there’s a big smiley-face lower grille opening that we’re not seeing in this photo, but I doubt it. That’s not the tough, rugged, [insert adjective that can only be uttered with a deep voice] heavy-duty truck way. Chevrolet says in its press release that engineers will begin on-road testing of prototypes soon to make sure the truck stands up to the brand’s durability targets. Chevy says “the bolder, larger proportions of the truck will be instantly apparent,” so expect to see giant camouflaged pickups near GM’s headquarters in Warren, on the hot and steep grades of the American southwest, and up north in the cold. Chevrolet says the truck will roll off the Flint production line in the third quarter of 2019, at which point it will likely strike fear into the headlights of helpless little cars like the beloved Renault Twingo.